The Oregon Health & Science University Graduate Student Organization (GSO) is an organization by and for graduate students of the School of Medicine. All students from PhD and Masters programs are GSO members and are welcome and encouraged to be involved. Graduate students from all programs share common needs and challenges; the GSO gives students a forum to discuss these issues. We provide a community, both academic and social, for graduate students at OHSU. The GSO promotes communication amongst students and faculty from the different disciplines and departments, while acting as an advocate for graduate students individually and as a whole. Meetings are held on the either the first Tuesday OR Wednesday of each month, at 12:00 PM (check the calendar or your email for exact dates and locations.) Meetings are open to all, and we always welcome new voices! Share your work with researchers across OHSU. All OHSU community members — including students, faculty, research-ranked employees, postdocs and others — are invited to submit abstracts for oral or poster presentations at OHSU Research Week, Monday, May 13 through Wednesday, May 15. The Research Week abstract submissions are open through midnight, Thursday, March 18. Share your work with researchers across OHSU. All OHSU community members — including students, faculty, research-ranked employees, postdocs and others — are invited to submit abstracts for oral or poster presentations at OHSU Research Week, Monday, May 13 through Wednesday, May 15. The Research Week abstract submissions are open through midnight, Thursday, March 18. Get your abstract submitted today! Are you interested in science communication? WIS is sponsoring three scholarships for the upcoming OMSI Science Communication Seminars on Saturday, March 23. You can learn more about the seminars available here. Applications for the scholarship open in late January and are due by March 1. You could also consider attending Science TALK! Registration is only $75 for students. Learn more here! Be on the lookout for some exciting library-sponsored events, including Abstract 101, Scientific Posters 101, and Oral Presentations 101. These can help you get ready for Research Week this year! The FLAME awards are March 5th and All-Hill is looking for peer nominations for these awards that recognize outstanding students/faculty/staff. The award categories are: Faculty; Forging the Way; Leadership in Student Service; Leadership in International Service; Advancement in Community Outreach and Clinical Service; All-Hill Volunteer of the Year; Mentor; and Excellence in Journalism. Due by Feb 22th. Make your nominations now. ​The union will begin bargaining in April! Be sure to vote for the students you want on the bargaining team. See the student bios here to learn more about the candidates. Are you interested in participating in the bargaining process? Consider joining a contract action team, where you will support those at the bargaining table by doing research and helping construct our contract! OpenCon Cascadia, a conference about data and science access, is on Saturday, February 2 with an evening dinner/networking event on February 1. Registration is a VOLUNTARY DONATION! This is a fantastic opportunity to go to a local conference about science policy, if you have any interest, you can visit their website to learn more or register now! Be sure to check out the bottom of our events page to learn about more local conference opportunities! There is a Tax Essentials seminar TODAY (January 9) from 4-5 pm in RJH4320. Come listen as Brian Rapp, CPA goes over some vital topics that pertain to graduate students such as filing taxes with a 1099-MISC, eligible deductions and credits, filing quarterly taxes, and how to avoid an audit! If you are attending the All-Hill Ski trip, you must purchase lift tickets by January 16 in order to receive the discount! Check your email for the promo code! Are you interested in science communication? WIS is sponsoring three scholarships for the upcoming OMSI Science Communication Seminars on Saturday, March 23. You can learn more about the seminars available here. Applications for the scholarship open in late January and are due by March 1. Look for further updates! The Intel Northwest Science Expo is coming up on April 12! Judges are needed in all areas, especially life sciences. Please consider supporting the next generation of scientists through this unique event. You can register to judge here. OHSU has agreed to drop their objection to our graduate researchers union! In case you haven't been following the battle, check out this article to find out more about OHSU's objection and how we fought for our union! ​Learn more about your union by checking out the website, liking the Facebook page, or following them on Twitter. There is an important change to the Lyft Off program hours: codes will be valid from 7 pm - 5:30 am! Also, if you do not use your code at least once per quarter, you will be removed from the program and you will have to reapply! Keep this in mind! Reminder: the GSO is sponsoring a Tax Essentials Seminar on January 9 from 4-5 pm! PLEASE RSVP! Brian Rapp, CPA and Senior Tax Manager at McDonald Jacobs, P.C., will help you figure out how to file your 2018 taxes. This seminar will be specifically geared towards graduate students who receive a stipend reported on a 1099-MISC form. If you have further housing questions (i.e. pets, disability services, etc.) please refer to the Sun River website or call their customer service number: (855) 420-8206. The GSO is hosting another pub night! Join your fellow graduate students on Wednesday, December 6th at Suki's Bar and Grill from 6-8pm for some tots, beer, and good company! Do you think your thesis work makes a compelling story? Do you want to share it with the world while also gaining invaluable communication experience? If you answered yes to these two questions, consider applying to the Young Scientist Seminars Competition! The Young Scientist Seminars (YSS) is a video series produced by iBiology that features early-career scientists giving talks about their research and discoveries. The YSS videos are freely available online and widely viewed by an international audience of students, scientists, educators, and the public. Applications are due by December 16, 2018! If chosen, you will receive an all-expenses paid trip to UCSF to attend a multi-day science communication workshop where you will make improvements to your talk and then record your seminar, which will then be available as a part of the Young Scientist Seminars. Winners will also receive a $500 honorarium! See the poster to the right for more information about applying today! Click on the poster above to visit the Young Scientist Series website where you can submit an application! Your student union is holding their first town hall! The event will be held from 5-6:30 pm in RJH4340. Come hear updates from your fellow students on your union campaign and hear from special guests - including Stacy Chamberlain Executive Director of Oregon AFSCME- leaders from recently organized non-profits, and representatives from other graduate unions. Panelists will share their experiences and then take questions from the audience. Food will be served! Did you know that students are able to be reimbursed up to $400 a month for dependent healthcare purchased? Please visit our Student Healthcare page to learn how you can be reimbursed for dependent healthcare! Are you struggling to pay medical bills? The majority of students will qualify for financial assistance! Through this program, you can receive full or partial coverage of medical services. For eligibility requirements and instructions on applying, see our Student Healthcare page! JBT has hired a new psychologist, Dr. Hanna Hoeflich, and there is no longer a waitlist for behavioral health visits! If you feel like you need extra support, do not hesitate to make an appointment ASAP! 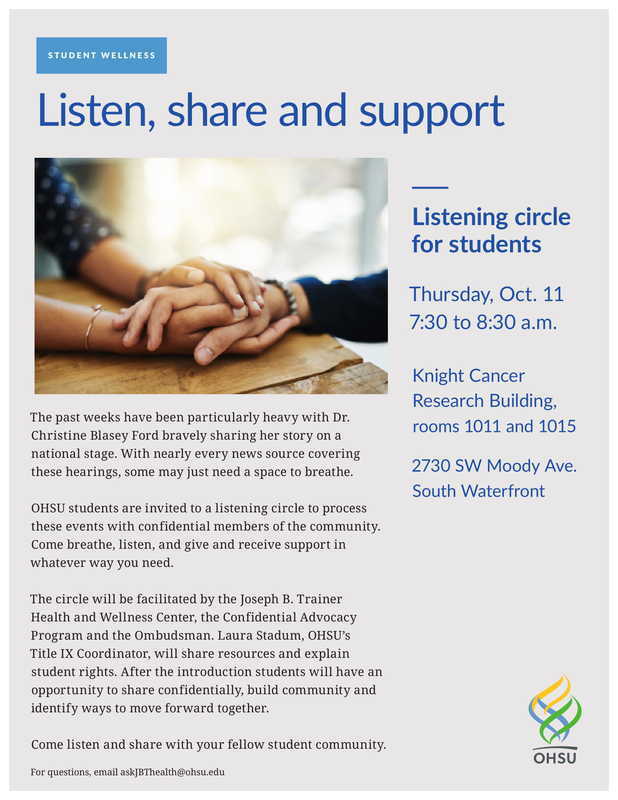 Tomorrow, October 11, there will be a special Student Listening Circle to offer confidential support to students following the difficult political events recently. Please see the flyer for specific details and consider taking advantage of this unique opportunity to connect with other students and receive support. There are two different grant-writing workshops that are coming up. If you'll be applying for a grant, consider taking advantage of one or both of these wonderful opportunities. Visit our events and upcoming courses page to learn more! Click the flyer above to visit the OnTrack website! OHSU has filed an objection to the formation of our student union! Let's show them that we are still standing strong and are united in our goal for garnering more respect for research at OHSU! Make your voice heard, get involved, and become a part of the team! Meetings occur twice a week. Check out the union website for more information about your student union and like our Facebook page where you can find more information about upcoming events! Did you know that the GSO is keeping track of relevant nanocourses, workshop series, or other courses that might be useful for graduate students throughout the year? Visit our "Upcoming Courses" page located under the "Student Resources" tab! Check back periodically to see if there are any new workshops or nanocourses that have been added. With the summer coming to a close and the fall quarter on the horizon, there are some things to keep on your radar! The Hertz Foundation is now accepting applications! The deadline to apply is October 24th with references due by October 26th. Please visit their website for more information about applying! The School of Medicine Science Communications Internship is being offered this academic year. Interns will work with Rachel Shafer, Senior Communications Specialist, and Mary Heinricher, Associate Dean for Research, to produce the Paper of the Month feature for Inside SOM. Additionally, interns will have the opportunity to write other pieces for the SOM, including articles for Bridges (our print Alumni Magazine) and other OHSU communications. This internship will help students create a portfolio of professionally produced, edited, and disseminated work. Applications are due by September 28th: see the flyer for more information about how to apply. We have officially filed authorization cards with the Oregon Employment Relations Board! The next step in the process of unionizing is electing a bargaining team. Do you want to be a part of this process? Do you have concerns about the structure or the issues that will be negotiated? Make your voice heard, get involved, and become a part of the team! Meetings occur twice a week. Check out the union website for more information about your student union. This fall, there is a professional development series open to all trainees and faculty on campus, including students. See the flyer for details. Please register via Compass by logging in with your OHSU credientials, clicking the "Browse" icon, then searching for "Professional Development Series". You may sign up for individual sessions, or the entire 4 month course! Looking for other professional development opportunities on campus? The Impact Challenge Series has several interesting and useful workshops coming up. Topics include tools for productivity, time management, high impact publishing, and tips for better slides or posters! Check out our event page for updates or the Library's website for the complete schedule. Today, Orgeon AFSCME and Oregon AFSCME and AFSCME Local 328 are throwing all graduate students a "welcome to the family" celebration to congratulate us on the filing of our union with the Oregon Labor Board! The event will be held from 4-6 pm on the Mac Hall Lawn. Meet union members and learn about our next steps. Food will be served! The School of Medicine has announced a unique opportunity for students to get involved in making an impact on the OHSU graduate student community! Mini-grants up to $500 are being offered to students that have innovative ideas that will strengthen community, engagement, and wellness within the SOM. If you have an idea for a project, don't hesitate to apply! The deadline for submission is August 30th. Please see this flyer for details. The GSO is currently looking for volunteers to assist at the Welcome to Campus BBQ, which will be happening on Thursday, September 27 from 5-7 pm on the Mac Hall Lawn. We are looking for folks to help clean-up, so if you think you'll be available to assist then please fill out the volunteer form! It is that time of year again: *get your annual Tri-Met pass* for a heavily discounted $90 giving you unlimited access to all of the local Portland transit options (bus, MAX, streetcar, etc.) and regular C-TRAN (Access to Vancouver, WA). Check out O2 for the dates and times to get your pass! Are you planning to travel to attend a conference, seminar, accept an award, or other event related to your academic studies during the Fall quarter? If so, you may be eligible for a Travel Award but you need to apply NOW! The deadline for summer applications is Friday, September 7! Visit our Travel Awards page to learn more about eligibility criteria and to fill out an application. ​Check out our new STEM News page for interesting articles about various topics in STEM across many different sources. It's updated monthly! Refer to the email that the GSO sent out on August 8th for specific details and information about how to RSVP for this exciting event! It's time! There is an *important event* for PhD students happening on Tuesday, August 14. Please refer to the email GSO sent out on August 8 for specific details and information about how to RSVP! JBT has some exciting news! There is a new massage therapist that has just started! All students get one free massage, even if you have already received one. Call JBT to schedule now! There is a new acupuncturist at JBT, Roger Batchelor! Please see the flyer for more details! *Are you interested in acupuncture but have never tried it and are worried about committing to a whole session? The School of Nursing offers Acupuncture to Desress, drop-in auricular acupuncture sessions! Check the schedule of events for the next one! JBT has hired a new therapist that will be starting in September to help meet the mental health needs of students on campus! If you have previously been referred out, you may want to check back in to see if you can get appointments on campus now. GSO is still looking for students that have attempted to claim the Oregon housing tax credit on their taxes during the past 3 years, but were audited and then were denied the tax credit. OHSU is working with the Oregon Department of Revenue to collect data, so if this applies to you and you are willing to submit your data, then contact the GSO! OHSU hopes to be able to amend state tax codes to allow students on 1099's to take this tax credit, which will allow students to resubmit their taxes and (potentially) get money back! Make sure you're checking our events page or calendar for all upcoming campus events! The results for the 2018 end of the year survey are in and we had a record number of student responses! A big thank you to all of the students that participated and congratulations to the lucky students that won their choice of coffee, tea, or some Blue Star donuts! The survey report is posted below, but we are also making the raw data available in case you, our constituents, want to access it to analyze yourselves (or perhaps you just need a data set to play with in R!) The data has been randomized by question so that no student’s answers can be identified. You can download the data below. The GSO will continue to communicate via email, but will substantially improve the website and the event calendar to increase the usability of these. Students do not seem to know what the administration stands for, so the GSO will facilitate events where the administration can talk about these issues to increase transparency and build trust. Happy summer everyone! There are a lot of exciting opportunities for students coming up! There are some *important informational sessions* happening next week that impact the lives of PhD students. Please refer to the email GSO sent out on July 5th for specific details and information about how to RSVP! The OHSU Library, the Career & Professional Development Center, and the Office of Postdoctoral Affairs are bringing back the *Impact Challenge*, a workshop series taking place over the summer and fall designed to assist students with navigating and implementing tactics and tools for sharing their work and building a professional network. All workshops are free. See the flyer to the right for details regarding the first event on July 11, which will focus on developing a networking plan that is dynamic, authentic, and multidimensional. Click on the flyer to RSVP or visit our Special Events page! Learn more about other events in the Impact Challenge series on the OHSU Library website. Click on the flyer for more details about this workshop and to RSVP!